The Mental health management chapter (chapter 12) reports on the performance of governments in the management of mental health. Mental illness is a significant cause of morbidity and mortality in Australia and is identified by governments as a national health priority area. This chapter reports on the performance of governments in the management of mental health. Mental illness is a significant cause of morbidity and mortality in Australia and is identified by governments as a national health priority area. Real government recurrent expenditure of around $7.7 billion was allocated to mental health services in 2013-14. State and Territory governments made the largest contribution ($4.8 billion, or 62.4 per cent), although this included some Australian Government funds under the National Health Reform Agreement. The Australian Government spent $2.9 billion or 37.6 per cent. In 2013-14, 1.8 per cent and 8.4 per cent of the total population received State and Territory governments' specialised mental health services and MBS subsidised mental health services, respectively. 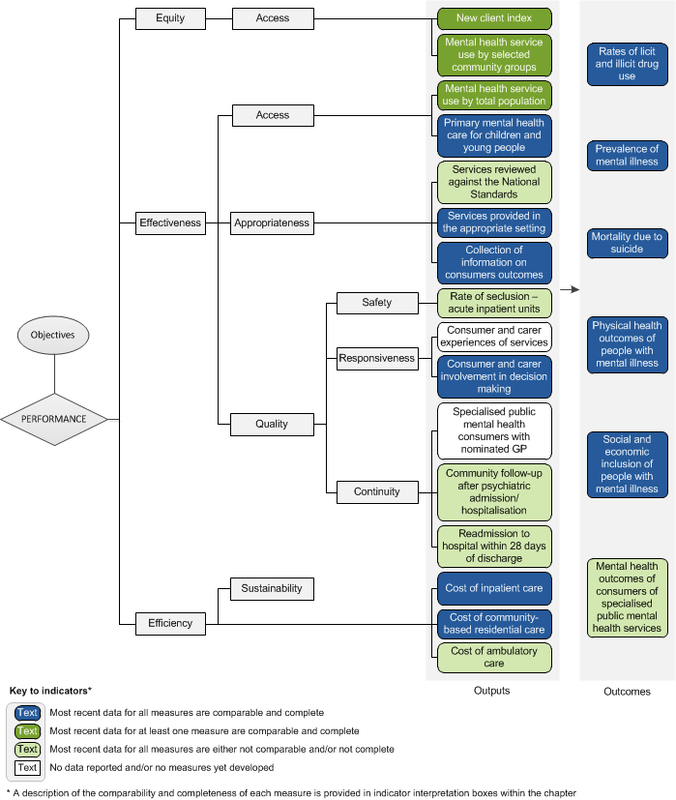 The performance indicator framework provides information on equity, efficiency and effectiveness, and distinguishes the outputs and outcomes of mental health management. The performance indicator framework shows which data are complete and comparable in the 2016 Report. Proportion of State and Territory governments' specialised public admitted patient overnight acute separations from psychiatric units for which a community-based ambulatory contact was recorded in the seven days following separation, 2013-14.